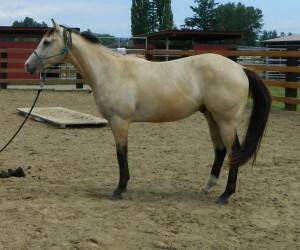 In the spring of 2010, the palomino mare down the road had the cutest little buckskin colt. All of us out here on the farm would drive by and ooh and ah at him–cuz he’s so darn handsome. Well, wouldn’t you know it by gosh, his owner asked one day if we’d like to adopt him. So believe it or not, we went and brought him home to Justa Pleasure Farm. He has gone through the Clinton Anderson Fundamentals course, and has a great start on him. 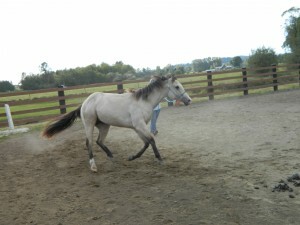 He has the temperament to be a lesson horse and everyone is lining up to ride him someday. He was meant to be here and was raised by Trigger–if ya knew Trigger, then you’ll understand this–If he grows up to be half the horse Trigger was, he’ll be worth his weight in gold. It has been quite an adventure watching Riggn come along. Thanks to some of my students for helping him become a great gelding. And congrats to Kylie on the purchase of Riggn. He has a great home and great future ahead of him. Wish all horses had a mind like him, he will be very missed by quite a few.